As fighting in Syria rages on between government forces and anti-government groups, the public continues to say that the U.S. does not have a responsibility to do something about the fighting there. 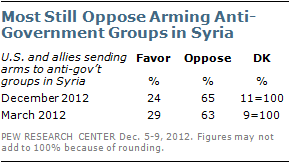 And there continues to be substantial opposition to sending arms to anti-government forces in Syria. The latest national survey by the Pew Research Center for the People & the Press, conducted Dec. 5-9 among 1,503 adults, also finds little change in the public’s sympathies in the conflict between Israel and the Palestinians: 50% say they sympathize more with Israel while just 10% sympathize more with the Palestinians. Only about quarter of Americans (27%) say the U.S. has a responsibility to do something about the fighting in Syria; more than twice as many (63%) say it does not. These views are virtually unchanged from March. Similarly, just 24% favor the U.S. and its allies sending arms and military supplies to anti-government groups in Syria, while 65% are opposed. These opinions also are little changed from March. Comparable majorities of Republicans (66%) , Democrats (61%) and independents (65%) say the U.S. does not have a responsibility to do something about the fighting in Syria, and all partisan groups also oppose arming anti-government groups. Those who have heard a lot about the situation in Syria offer modestly more support for U.S. involvement than those who have heard less (35% vs. 22%), but still, on balance, say the U.S. does not have a responsibility to get involved. Opinions about the United States’ responsibility to act in Syria are similar to views about obligation to act in Libya, before the U.S. and its allies launched airstrikes against Moammar Gadhafi’s forces. In March 2011, just 27% said the U.S. had a responsibility to do something about the fighting in Libya — the same percentage that says that about Syria today. Higher percentages said the U.S. had a responsibility to do something about the fighting in Darfur in 2006 (51%) and fighting between Serbs and Bosnians in Kosovo in 1999. There has long been little public interest in the conflict in Syria. In a separate survey conducted last week (Dec. 6-9), just 19% say they are paying very close attention to political violence in Syria, while 28% say they are following this story fairly closely. About half (52%) are paying little or no attention to developments there. For decades, the public has sympathized with Israel over the Palestinians and that remains the case today. Overall, 50% say they sympathize more with Israel, compared with just 10% who say they sympathize more with the Palestinians; almost a quarter (23%) do not offer an opinion while 13% volunteer that they sympathize with neither side, and 4% say both. Attitudes on this question have been stable over the past six years, after showing more volatility in the middle of the last decade. 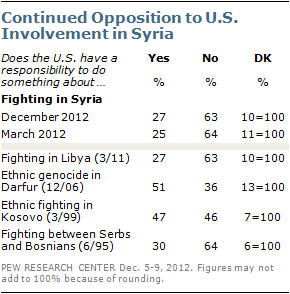 There continue to be stark partisan differences in Middle East sympathies. Conservative Republicans maintain strong support for Israel with fully 75% saying they sympathize with Israel compared with just 2% who sympathize with the Palestinians. By contrast, liberal Democrats are much more divided: 33% sympathize more with Israel, 22% with the Palestinians. Independents sympathize more with Israel by a 47% to 13% margin. 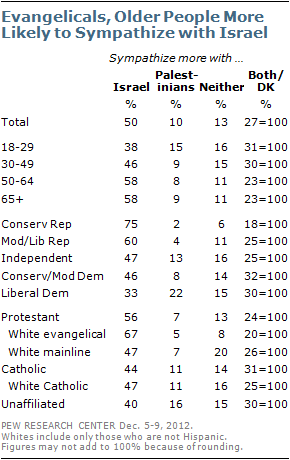 Among religious groups, white evangelical Protestants remain strongly supportive of Israel. 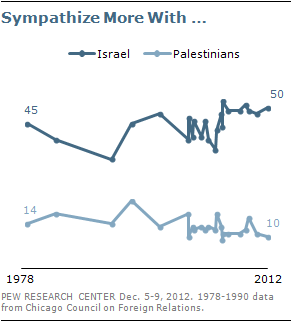 Two-thirds (67%) say they sympathize more with Israel; only 5% say they sympathize more with the Palestinians. Opinion among other religious groups is more mixed. Catholics, for example, offer more sympathy for Israel than the Palestinians by a 44% to 11% margin. There also are age differences in Mideast sympathies. About four-in-ten (38%) people younger than 30 sympathize more with Israel than the Palestinians. That is only slightly lower than the percentage of 30-49 year olds who sympathize with Israel (46%). However, more than half of those 50 and older (58%) sympathize with Israel more than the Palestinians. Age differences were more modest in 2011 and 2010. Large Majorities in Both Parties Say NATO Is Good for the U.S.